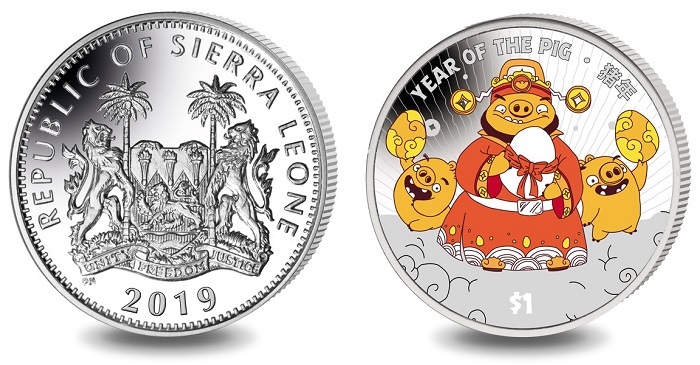 The Bank of Sierra Leone has issued (21st January) new crown coins which cheerfully mark the Lunar Year of the Pig with a little help from the game world’s irreverent and popular Angry Birds. 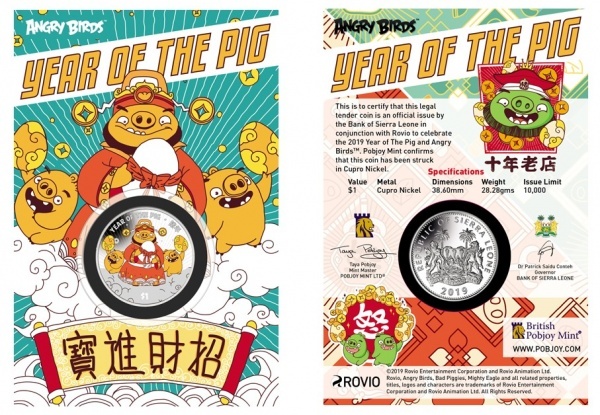 Issued by the Bank of Sierra Leone in conjunction with Rovio Entertainment Corporation, this new coin features Leonard, the king of Piggy Island in Angry Birds, with two of his pigs wishing you good fortune for the Chinese New Year. Angry Birds hatched as a casual mobile game that has blossomed into one of the most beloved entertainment brands in the world, inspiring over a dozen games, billions of consumer products, several animated series, and a hit blockbuster movie. In the centre of the story is the epic battle between the flightless birds and the green pigs. Why do they fight? Well, it’s quite simple, because the pigs keep orchestrating new outlandish schemes for stealing the birds’ eggs to bring back to their greedy king. But these eggs contain the birds’ precious hatch-lings, which they must protect at all cost. Using whatever means necessary, the birds, led by the reclusive Red, must find a way to foil the plans of the pigs. 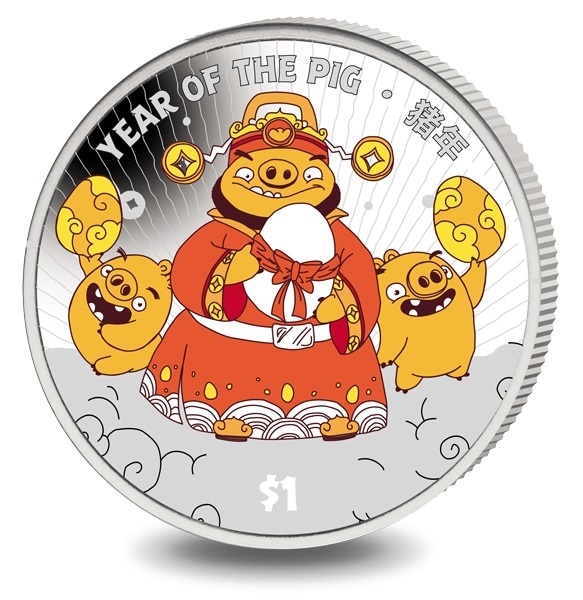 However, on the coin, Leonard and his two helpers appear to have undergone a change of heart and are wishing us good luck during the Lunar Year of the Pig. Those born under the sign of the Pig are said to be warm-hearted, honest, and tolerant to others. They dislike quarreling so they usually get on well with everyone. The coins are produced by the Pobjoy Mint, at their facilities in Surrey, England, on behalf of the Bank of Sierra Leone. Struck in cupro-nickel, and with a colour design on the reverse, this exclusive coin shows the three characters clutching eggs while standing on a cloud with the sun rising behind them. 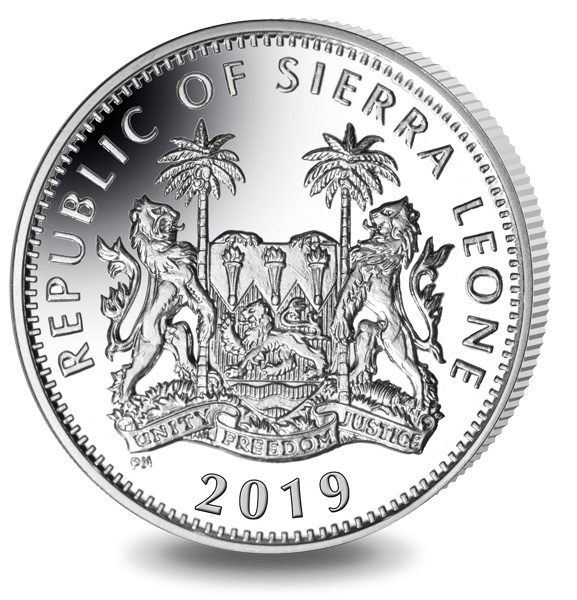 The obverse of the coin features the crest of the Republic of Sierra Leone, which is centred in the middle of the coin with the text REPUBLIC OF SIERRA LEONE placed above the crest. The year of issue, 2019, is shown beneath the crest. The coins are available for pre-issue ordering now with expected delivery occurring on the 28th January. They are packaged in a colourful folder with graphics replicating the design on the reverse side of the coin. For additional information about this coin and others issued by the Bank of Sierra Leone, please visit the website of the Pobjoy Mint.